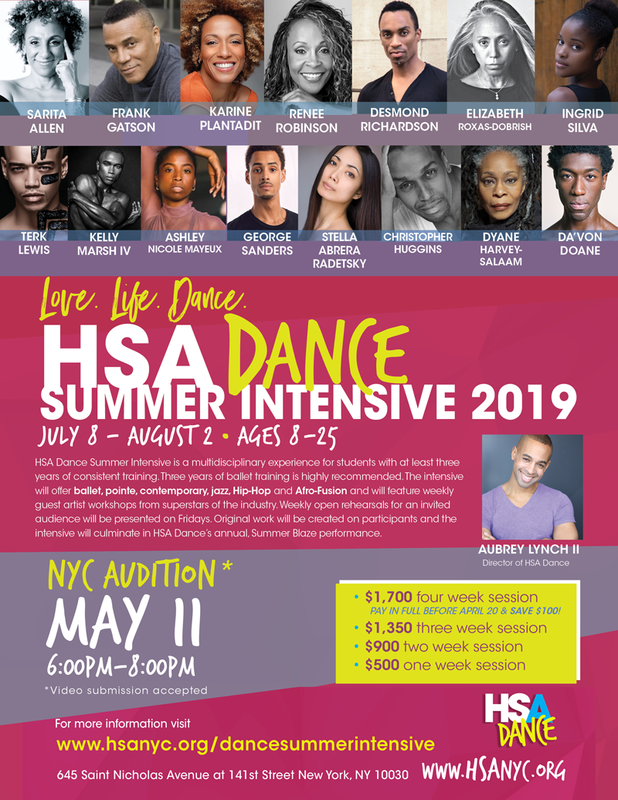 Information for HSA Dance Summer Intensive 2019 Below! HSA Dance Summer Intensive is a ballet based, multidisciplinary experience for students with at least three years of consistent training. Ballet and Contemporary Modern Ballet classes will be a part of the daily curriculum. Pointe classes will also be offered. Three years of ballet training is recommended. To complement the ballet focus, the intensive will offer contemporary, jazz, Hip-Hop and African two to three times per week and will feature weekly guest artist workshops from superstars of the industry. Weekly open rehearsals for an invited audience will be presented. Original work will be created on participants and the intensive will culminate in HSA Dance’s annual, Summer Blaze performance. Participants pre-register at the link above then attend one of the ballet and contemporary audition classes below. Or, pre-register and email link to a video. See video submission below. For in-person auditions, please wear ballet attire, hair in a bun for ladies. Accepted and wait listed students will be notified by email directly after their audition or video assessment. Should we reach capacity, priority will be given to dancers who pre-register online by the time stamp of their registration. 1. Email a one minute solo in ballet, contemporary or a modern technique that shows off classical lines to alynch@hsanyc.org. Movement phrases or class exercises are okay. Links to YouTube and Instagram accepted. Studio Showing every Friday for first three weeks.